Everyone can shop! During the last weekend in February, the store will be open to all. Tell everyone you know to come and take advantage of our great organic produce, tasty treats and affordable prices! The Co-op’s lease has been terminated, but it’s still business as usual. As the letter from the Board outlines below, the store will continue to operate normally until further notice, which means we still need everyone to continue to shop and work their shifts. Let’s keep our Co-op community going strong! There will be a special meeting on Wednesday, February 28, to discuss and vote on the Co-op’s future. All member-owners are strongly encouraged to participate, and the Board will share its recommendations ahead of time. There will be the opportunity to vote online if you’re unable to attend in person. Please watch for email updates from the board that will be sent to all member-owners. Wonder where our delicious fruit comes from? This month’s Product Spotlight is on Kauffman’s Fruit Farm. And last but not least, this month’s Co-op Q&A features one of our founding members and previous newsletter recipe contributor Molly Neuman. Did you know we had a trained chef writing those recipes? Open Shopping Days at the Co-op! Everyone is invited to shop for the last weekend of this month, and you don’t have to be a member. Invite all of your neighbors, teachers, students, family, and friends to shop at the Co-op, comittment-free! Join us Saturday February 24 and Sunday February 25 for delicious produce, oodles of bulk products, and all of the staples you need. Member-owners and the Board of Directors met in an emergency meeting on February 12 to discuss the future of the Co-op. As members were notified on January 25, our lease was terminated because of the sale of our building to a developer. We have limited time to vacate our current location — which must happen by April 30, according to the eviction notice — and make decisions about our future. Our store hours and merchandise are the same. Please continue to shop, work your shifts, and contribute to your committee. Continue to meet other member-owners when you’re in the store. On February 28, from 7 p.m. to 9 p.m., there will be a special meeting of member-owners to hold a discussion and vote. It is there and then that we will settle the outcome of the Greene Hill Food Co-op.The Board will send an email to member-owners detailing our recommendations before the February 28 meeting. If you are interested in the future of the Co-op, and want to be a part of this decision making, we encourage you to attend. If you are not able to attend in person, online voting will be available. The results of the vote will be tallied at a follow-up meeting on March 7. Simply stated, we have a limited time to take responsible action consistent with the principles that have guided the Greene Hill Food Co-op thus far. Our challenges are many, but our community has a wealth of experience, expertise, and vision. Questions? Concerns? Contact us at board@greenehillfood.coop. Congee is a savory rice porridge, cooked low and slow with vegetable or chicken broth. This traditional Asian and East Asian breakfast dish is easy to make, nutritious, and a great way to use up the odds and ends in your fridge. As a newcomer to this dish (I became obsessed with it at a congee pop-up in Queens), I take lots of liberties with the way I make it and how I garnish it. With the diversity of produce available in our co-op, you can do the same! The rice for this recipe is Lundberg Farm’s Organic Sushi Rice, grown by sustainable farmers in California. Our Nasoya Organic Extra Firm Tofu can be found in the refrigerated section of the Co-op. It’s a sustainable source of protein, and is one of the only plant-based proteins that contains all 8 essential amino acids. 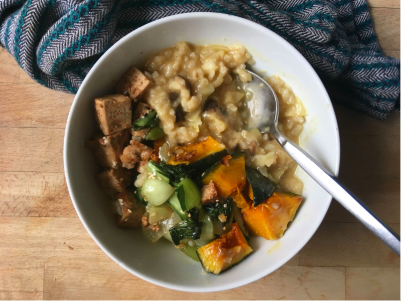 When paired with congee, it creates a nourishing, filling meal perfect for any time of day! Finally, the dehydrated mushrooms are porcinis, which come from one of our sustainable bulk suppliers. Suggested toppings: Roasted winter squash, chopped scallions, toasted sesame oil and soft boiled egg. Start the congee by sauteing garlic, ginger, and scallions in olive oil until softened, for 3-5 minutes. If you have it on hand, add a touch of sesame oil for more flavor. Add rice and saute for 30 seconds, and then add the broth or water and salt. Bring to a boil and then turn down to a simmer for at least 1 hour. If it looks like the rice needs more liquid, add as much broth or water to reach a consistency that you like. Meanwhile, place the dehydrated mushrooms in a heatproof bowl and pour boiling water over them. Let sit for 20-30 minutes and drain. Then slice the mushrooms and add to the rice. As the rice cooks, preheat your oven to 350 degrees for the tofu. Make the hoisin sauce by whisking all ingredients together. Cut block of tofu into cubes. Then transfer into a baking dish and slather with hoisin sauce. You may not need to use the entire batch of sauce, so set the rest aside as a topping for your congee. Bake tofu in oven for 35-45 minutes. When congee is ready, ladle into bowls and top with tofu, and and any other toppings you might have on hand. Enjoy! Wonder where our delicious fruit comes from? Not so far away. Located in Lancaster County, Pennsylvania, Kauffman’s Fruit Farm spans more than 100 acres of cropland, growing apples, peaches, cherries, pears, and plums. Founders Amos L. and Sue Kauffman planted their first apple trees in 1911 and the business is still run by their descendents today. Like the Co-op, Kauffman’s shares a dedication to economic, environmental and social issues. The farm uses Integrated Pest Management (IPM) to reduce the use of pesticides, applying natural strategies to control pests in the orchards and keep the fruit healthy while minimizing damage to the environment. These methods include encouraging pest predators like ladybugs, hawks, owls and other beneficial populations to minimize pests naturally. 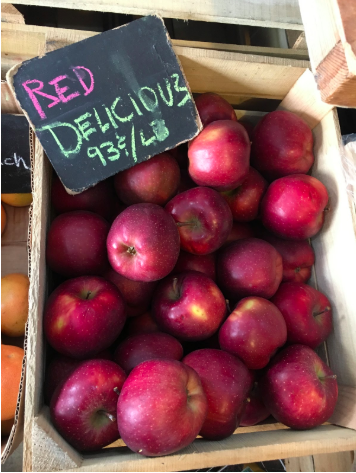 Their apples are great for snacking and make delicious applesauce, too. Molly Neuman, a founding member of Greene Hill Food Co-op, was the writer behind our monthly newsletter recipes for the past few years. Before she started writing our recipe column, she coordinated food demos at Greene Hill’s community events. She is a graduate of the Natural Gourmet Institute. Q: How did first you become involved with the Co-op? A: I am a proud founding member! I moved to Crown Heights in June of 2011 and was so thrilled to learn there would be a co-op in the neighborhood and joined with the first opportunity in January of 2012. Q: How did you get started as our recipe contributor? Have you always loved to cook? We love your recipes! A: As a student at the Natural Gourmet Institute in the Chef's Training Program, I would fulfill some of my work obligations at the Park Slope Food Co-op under the leadership of one of my teachers, Sue Baldassano. She coordinated the cooking classes there and I was really excited to be part of the education committee and hopefully build something similar at Greene Hill. Because our facility and operation is smaller, on-site classes haven't been an option. But in the first years, our committee would do demos when the outreach committee was tabling or there were other community events. My favorite was a demo we did at the Walt Whitman housing community. When my work and life schedule made demos less feasible I transitioned to the monthly recipe in the newsletter which was more flexible and worked better for me when my daughter was born. Q: What do you like most about being involved with Greene Hill? A: Being connected to the community is very important to our family, as is access to the best food at fair prices. The work the membership and leadership put into making the Co-op maneuver all the challenges we've faced over the years is really tremendous. Q: What do you do outside of the Co-op? I am just starting a new role as Global Head of Business Development for a company called Songtrust which I'm really excited about. For the last two years, I've been Head of Music at Kickstarter which was an amazing experience. When I graduated from the Natural Gourmet Institute, I worked a side hustle as a caterer, private chef, and cooking instructor, but I don't cook for work anymore. My most important job is mom to my nearly four-year-old Lucia and partner to my husband, Alex. Q: What is your favorite winter meal to make? A: I love stews during the winter but if we're having company my favorite thing to make is paella! Photo credits: Shopping photo by Kelsey Chauvin, congee pic by Aly Miller, photo of Molly Neuman and her daughter courtesy of Molly, Apple crate photo by DK Holland. 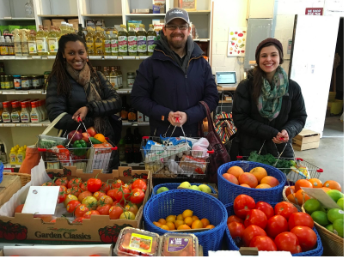 The Greene Hill Food Co-op Monthly is edited and published by the following member-owners (in alphabetical order): Liz Baker, Carola Burroughs, DK Holland, Alexandra (Aly) Miller, and Gitta Zomorodi. Contact us with any feedback, suggestions, or requests at TheMonthly@greenehillfood.coop.